A new concert at the Lyric Opera recalls the Golden Age of radio, when anything was possible. Evolving from the technology of World War I, broadcasts reached into millions of homes, filling billions of minds with the culture and news of the day. One of the leading dramatists of radio’s heyday in the 1930s and 40s was Norman Corwin. Using only voices, sound effects and the occasional full orchestra, he invited listeners into worlds conjured entirely of suggestion and imagination. “The style of writing was very visual, because it was written for the radio, so the words themselves had to create the world the audience would imagine,” says Edward Berkeley, who uses Corwin’s famous 1941 play “The Anatomy of Sound” to construct a new concept for the Lyric Opera of Kansas City’s Exploration Series. In this production, the Lyric’s Resident Artists will perform not only all the roles, but all the sound effects, too. 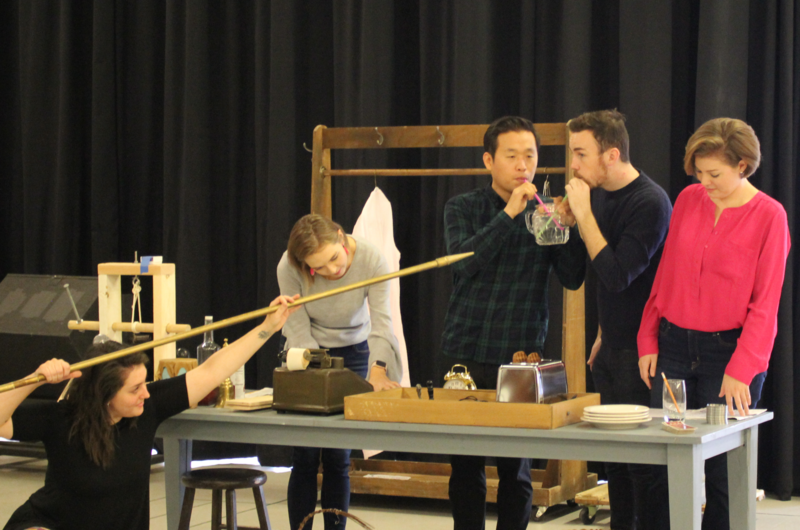 Lyric Opera of Kansas City resident artists Joseph Leppek and SeokJong Baek (center) make a percolating sound effect while Kaylie Kalich (left) and Kelly Birch (right) wait for cues; Sarah Jeter holds a prop spear as if it's a boom microphone. While the set up won’t be quite that elaborate, the Lyric’s setting is intended to look like a “Golden Age”-era radio studio. Berkeley, who directs theater and opera and teaches at The Juilliard School and Aspen Opera Theater Center, has long been fascinated with Corwin’s work, and adapted a few Corwin plays for an Off-Broadway production in the 1990s. Corwin’s “The Anatomy of Sound” (originally performed by Gale Sondergaard, the first recipient of the Academy Award for Best Supporting Actress in 1939, incidentally) examines how sound works and why sound works in establishing setting and mood. Through many manipulations, dissecting the different meanings and intention in the sounds of audio play, Corwin demonstrates what train whistles, heartbeats, chewed celery, footsteps, thunder, and even silence can do in storytelling. Though it’s unlikely they ever worked with Corwin, the composers of the two operas Berkeley also includes in the project met as students at the Curtis Institute of Music in Philadelphia in 1928. Menotti, 17, was newly arrived from Italy via South America with limited knowledge of the English language, and Barber, a year older, was already a star student in voice, piano and composition. They developed a personal and professional relationship that lasted more than forty years. The comedic opera is a tale of small town gossip and shifting morals, partly based on Menotti’s observations visiting Barber’s family in West Chester, Pennsylvania. The innovative work “convinced his audience that microphones and loudspeakers can do a brilliant job of dispensing with the need for costumes, footlights, and greasepaint,” writes Menotti biographer John Gruen. Each arietta delves into the character’s internal monologue as the game progresses, displaying fantasies and revealing secrets. “As a piece it has a lot in it: people stepping out of one reality, which is the game, into their personal reality,” Berkeley says. It’s this layering of realities, in opera and in radio, that makes the realm of imagination so vast – whether a listener is transported across the ocean or out to space, into the mind of a child or someone who holds a dark secret. All of those places are just sound waves coalesced and colored-in by an individual’s mind. “High Fidelity Opera,” part of Lyric Opera of Kansas City’s Explorations Series, 7:30 p.m. Saturday, November 17, at the Michael & Ginger Frost Productions Arts Building, 712 E 18th Street, Kansas City, Missouri. Ricky Greer, a senior at Central High School, watched the 1961 movie version of “West Side Story” for the first time this summer. While the movie was a lot like reality with the “gangbanging and people dying,” he says, he didn’t buy the entire story. Carmen, Mimi, Norma, Tosca, Violetta, Cio-Cio-San, Medea, Liù, Aida, Lulu: Being an opera heroine is harrowing work. For hundreds of years, opera's women have suffered: on stage from dishonor, ruination, madness and death; off stage from harassment, abuse, degradation, threats, and coercion.